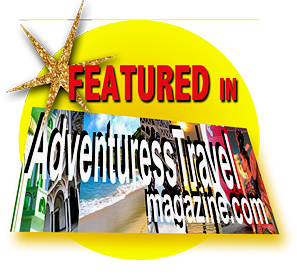 Includes swaying palm trees, towering volcanos in the distance and lots of smiles and aloha! Tucson to Kona on American Airlines started bright and early. Phoenix Sky Harbor’s morning rush hour airplane traffic caused delays and our scheduled 25-minute puddle jumper flight ended up being a two-hour first leg. Don’t you love how they can board and push back, then sit for 45 minutes on the tarmac and call it an “on-time” departure? Without having to run, we got to the gate in Phoenix as the boarding was beginning. 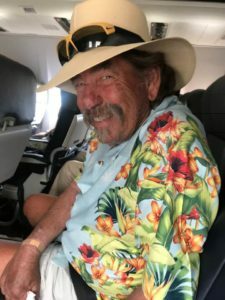 I’d reserved an aisle and window seat and fortunately, the plane was so crowded someone coveted our middle seat, so Bub and I had plenty of wiggle room for the uneventful 5-hour flight! Deplaning in Kona, the smell of flowers permeates my senses as giddy joy courses through me. Picking up the rental car at Budget, because I had neglected to enter my Fast Track number when making the reservation, the rude lady behind the counter made me go to the end of the ordinary people line, but I was in paradise, after all, and life is too short to stress about the little things. 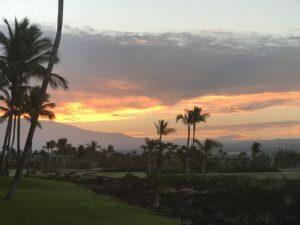 We provisioned at Costco and Kona Wine and headed north to The Bay Club at Waikoloa Village. Happy check-in: Half of our time was reserved with my timeshare 2018 points and the second half with what Hilton Vacation Club calls “Open Season” (meaning discounted rates booked within 30 days of a stay ). I had called to see if we could stay in the same unit instead of having to check out and move and was told that had to be handled at check-in. The last 3 years, this couldn’t be arranged, but today was our lucky day and we are situated in a two bedroom, 1200 sq ft. suite surrounded by expansive views from a wrap-around lanai. We’ve arrived in the middle of Happy Hour at the Kohala Suites Pool Bar and the Mai Tais were generously poured. Drinks in hand, we sink into the warmth of the bubbling spa and watch the clouds turn pink as the sun sinks into the west. I’ve seen the green flash twice from this side of the Big Island. Perhaps, on this trip, I’ll get a third siting!